A new BB-8 toy from Spin Master can follow its owner and react to words spoken around it. NEW YORK — If you've been dreaming of a real-life BB-8 ever since you saw "Star Wars: The Force Awakens," then your dreams are about to come true. Easily one of the most anticipated (and coolest) toys at Toy Fair 2016 was Spin Master's near-life-size version of the "Star Wars" droid BB-8. The toy stands 19 inches (48 centimeters) tall if you count the antenna, only 7 inches (18 cm) shorter than the droid in the movie. But it's not just its size that sets this BB-8 apart from earlier versions, like the small BB-8 from Sphero and its larger sibling from Hasbro. This robot is also completely responsive. While it does come with a remote that allows you to steer the toy, this BB-8 also has a much-cooler "follow-me" mode: When you start walking, the little guy will follow right on your heels. Just don't break out into a sprint and expect the droid to follow; the Spin Master BB-8 won't be fast enough to run after you. Spin Master's new voice-controlled BB-8 droid would delight any fan of "Star Wars: The Force Awakens." The droid toy was unveiled at the 2016 New York Toy Fair. Also adding to the cool factor is the toy's voice recognition. When you talk to BB-8, it will respond with all the familiar droid sounds you remember from the movie. Spin Master toy designers used sound bites from the actual film to make sure their BB-8 is authentic. And the droid can respond to more than one voice. If there are multiple people in the room, the toy will interact with the voices it hears in the room. All of this responsive technology adds up to a BB-8 toy with all the personality and sass of the droid from the movie. "You don't even need to the controller to be fully interactive with it," said Spin Master brand manager Joe Smith. "The beauty of this character is really the essence of its personality." 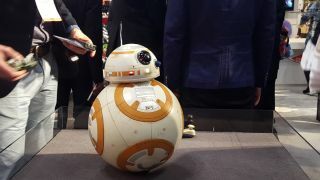 It's so realistic, in fact, that Spin Master's consultants from "Star Wars" creators Lucasfilm saw the toy and said, "You guys made BB-8," Thomas Tretter, design director on the project, told Space.com. Part of what makes this toy so realistic are little details, like word-recognition technology that makes BB-8 freak out when you say things like"Stormtrooper" or "Kylo Ren." BB-8's body and head come in two separate pieces, and the finished version, Tretter said, will scream if you take off its head. BB-8's body is rechargeable, and 2 hours spent charging equates to about 1 hour of play. AA batteries are needed for both the remote and the head portion of BB-8. Spin Master said it plans to release the droid in September, and the toy will cost around $179.